A joyful rescue dog showed just how much she loves her foster mom for keeping her and her puppies safe. 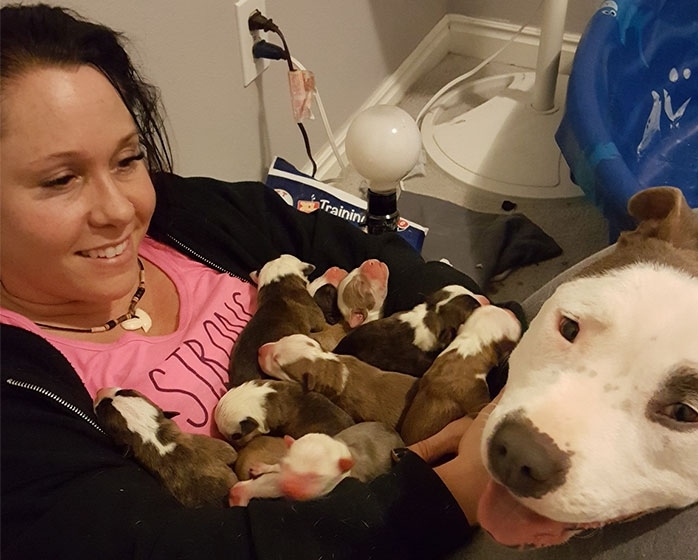 In an adorable video, Grayce the pit bull, expressed her gratitude to foster mom Stevoni Wells Doyle when she gently picked up her 11 puppies and placed each of them in her lap. Doyle took Grayce in while she was still pregnant. The sweet dog gave birth to 10 boys and one girl in Doyle's home. In the video, the happy dog was seen placing the last three pups in her arms as her foster mom sat on the floor. What am I supposed to do with all these guys? What do you need? Do you need help from me or do you just want to love me?' Doyle is heard saying as she gently rubs Grayce's head. 'You are so precious. Thank you so much for sharing these babies,' Doyle said to Grayce. Doyle then asked a man recording the video: 'Isn't that the weirdest thing you've ever seen?' The cute moment lasted for nearly two minutes as Grayce enjoyed all of the love from Doyle and her puppies. 'She just wants love, but she won't leave them alone,' the man recording is heard saying in the background. 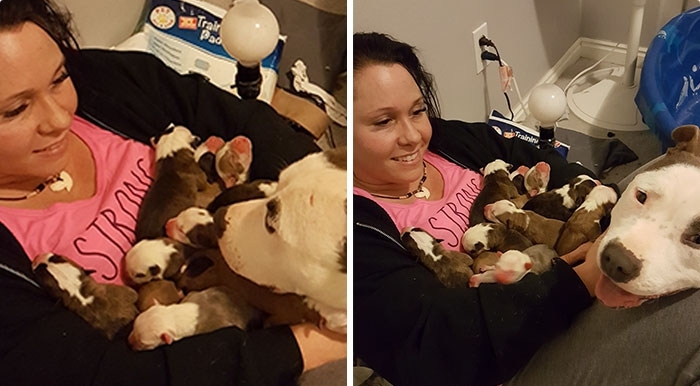 Responses to "Woman Overwhelmed When Her Rescue Pit Bull Places Her 11 Newborn Puppies Into Her Lap"